A crossroads is where tricksters lurk, where uncertainty prevails, where the possibility becomes clear that things may not go quite as they were planned. Crossroads are liminal spaces, both metaphorically and realistically. They are places of rebirth and reinvention, of transformation and confusion. They are doorways, marketplaces — places where things are traded, where value is assessed and ascribed, and where cultures meet. Crossroads are full of danger and promise, which is part of their allure. Johnson was singing about a specific place where he sold his soul to the devil. In this legend, the crossroads was an intersection and a threshold, a place where roads cross and where he could cross over, where things mix that should not mix, and where that mixture, no matter how impure, generates something new. where music crossed paths: New Orleans, Memphis, New York, Chicago. Popular music is the product of these intersections of race, gender, class, and religion. Music migrates and crosses cultural, political, and national boundaries with remarkable speed, penetrating unintended places and allowing new tricksters to find their voices in between the expected styles. Pretty much all of global pop music has its roots in some other kind of music from some other place. The musical world has been moving steadily toward the hybrid and the messy. Music always creeps into the cultural cracks and opens up new spaces for enjoyment, expression, and connection. This blatant musical composite is part of what makes it so pleasurable and so provocative. genre, but even genres seem inadequate to describe so much of popular music. Spotify and other streaming services now offer playlists designed to match one’s moods, and they are always serving up recommendations for new songs that lie just beyond the choices we might figure out for ourselves. heat for bringing gospel into popular music, and the Beatles and the Rolling Stones cut their musical teeth playing covers of African American blues recordings. music — is what makes communication and transformation possible. But here’s the thing: Robert Johnson did not sell his soul to the devil to play the blues, though his lyrics sound as though he may have. He certainly spent time at the crossroads and enough time with other transients to bring sounds from one place to another and back again. And his music flirted with the danger of mixing with people and elements that were always from somewhere else. and crossroads. While singing about going down to the crossroads may not mean that you are going to sell your soul, in the process of crossing over and crossing back, it may sound as though you have. Or maybe you give a little of your soul away because you can’t keep it all to yourself. That’s the nature of exchange. Not crossing over is never an option. When you reach a crossroads, you have no choice but to make a choice. *© 2017 Sony Music Entertainment. All Rights Reserved. This story "Where Tricksters Lurk" was written by Ari Y. Kelman. 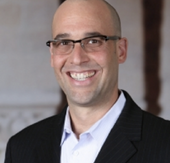 Ari is the inaugural holder of the Jim Joseph Professorship in Education and Jewish Studies in the Stanford Graduate School of Education, where he also directs the Concentration in Education and Jewish Studies. He holds a courtesy appointment in Religious Studies and is a faculty-affiliate of the Center for Comparative Studies in Race and Ethnicity, the American Studies Program, and the Taube Center for Jewish Studies. He is the author of a few books about American Jewish life and culture, including Station Identification: A Cultural History of Yiddish Radio and Sacred Strategies: Transforming Synagogues from Functional to Visionary. His research revolves around the ongoing exploration of how people learn to develop religious sensibilities, and it has taken him to church, to Krakow, Poland, to many b’nai mitzvah and deep into the archives of religious music of the early 1970s.